Do you think a pedestrian bridge between Jersey City and NYC is a good idea? Would you want to walk to Manhattan if you worked there? Or just take a stroll or bike ride over to Battery Park? A Jersey City resident has high hopes for just that concept. 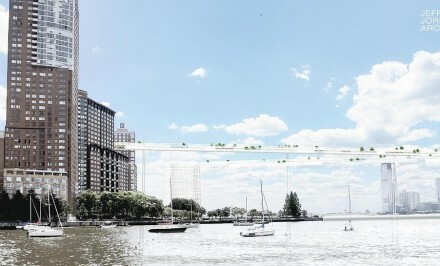 Kevin Shane dreamed up the concept of a pedestrian bridge linking the Sixth Street Embankment in Downtown Jersey City and Lower Manhattan. Shane was so into the idea that he got together with architect Jeff Jordan to create renderings depicting what they dub the Liberty Bridge. The bridge would span 5,000 feet and rise 200 feet above the Hudson River. In addition to pedestrians, it would also be open to cyclists. Shane has created an online petition calling for Mayor Steve Fulop, Gov. Chris Christie and Gov. Andrew Cuomo to back their proposal. Fulop said he would "love to see it" happen, but said he didn't think it was "anything more than a dream right now." Do you think a pedestrian bridge would be something you would use and like to see in the future? POUGHKEEPSIE—Nearly 1500 runners are expected to converge on Dutchess County on Saturday, June 13th for the first annual Walkway Marathon race series, which is being presented in partnership with Dutchess County Government, and will feature a marathon, half-marathon and the already established Treetops to Rooftops 5K event. Representatives from the Walkway Over the Hudson organization, Dutchess County Government, Marist College and several other partnering organizations unveiled plans for the new premier running event on Tuesday, during a press conference held at Walkway State Park’s eastern entrance. The event, which will serve as one of the Walkway organization’s primary fundraisers for 2015, will feature marathon and half-marathon routes that begin at Marist College, include a significant stretch of the William R. Steinhaus Dutchess Rail Trail in Dutchess County, cross over the Walkway Over the Hudson , with a turnaround on the Hudson Valley Rail Trail in Ulster County. “We are excited to partner with the Walkway Over the Hudson for what I am sure will become one the premier events in the Hudson River Valley. The Walkway Marathon gives us the opportunity to showcase our beautiful campus to runners, visitors and guests throughout the region. The course presents a unique opportunity for runners to start and finish the marathon from one of the most scenic stretches of the Hudson River,” said Tim Murray, Athletic Director at Marist College. The Walkway Marathon and Half-Marathon races will build upon the well-established Mid-Hudson Road Runners Club Treetops to Rooftops 5K race that has been attracting hundreds of area runners to Walkway State Park annually for the last four years. Runners interested in registering for any of the Walkway Marathon races scheduled for Saturday, June 13th can do so by visiting the Walkway Marathon website at WalkwayMarathon.org. Registration will officially open on Tuesday, December 2, 2014. Roger Robinson, a longtime columnist with Running Times Magazine, embraced the idea of the Walkway Marathon, adding that the event will help solidify the long-term alliance between running and linear parks. “Runners back in the 1960s were the first in the world to used disused railroads and old canal tow-paths for recreational exercise. The much bigger sport today continues to be active in the development of linear parks as safe and scenic places to run. With miles of trail, and the unique asset of the Walkway Over the Hudson, this race will be a leader in the ongoing alliance between running and the environment,” Dr. Robinson said. Organizers also plan to pursue “green certification” for the race from Athletes for a Fit Planet, making it one of the first green Marathons in New York State. Sustainable practices, such as shuttling runners using Dutchess County Government’s public transit system’s hybrid buses, and race bibs and other elements made from recycled materials will be followed wherever possible. Walkway thanked lead race sponsors Royal Carting and Health Quest during the press conference for their pledges of support for the new recreational venture. Additional sponsorships are available and interested parties can contact Walkway Development Manager Ellen Henneberry at (845) 454-9649. Please check back for more information and Registration on Tuesday, December 2, 2014. Tappen Zee Bridge WalkWay Over Hudson Redux ? The Tappan Zee Bridge will be replaced, and one proposal envisions the original as a suburban High Line. 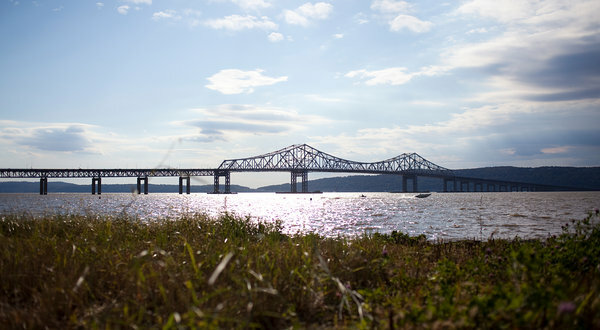 It seemed quixotic at first, but maybe the idea of turning the Tappan Zee Bridge into a walkway after a new bridge is built is not so far fetched after all. State officials said Wednesday that they were exploring the possibility of turning the three-mile-long bridge into a route for pedestrians and bicyclists along the lines of the High Line on the West Side of Manhattan, or the equally successful Walkway Over the Hudson linking Poughkeepsie and Highland. Gov. Andrew M. Cuomo and aides said at a cabinet meeting in Albany that it would cost $150 million to demolish the existing bridge, which carries the New York State Thruway, so turning it into a walkway connecting Rockland and Westchester Counties was worth exploring. After more than 10 years of study, building a new bridge finally seemed to reach critical mass last fall when it was one of 14 projects chosen by the Obama administration for expedited federal review and approval — possibly allowing work on a new $5 billion bridge to begin as early as spring 2013. The bridge is 56 years old — 6 years past its anticipated life span — and needs $50 million in maintenance and repairs annually. The initial reactions from public officials were cool, and some said the steep pitch of the Tappan Zee, compared, for example, with the flat Walkway Over the Hudson, could make a park plan impractical. But on Wednesday, Mr. Cuomo and Thomas Madison, executive director of the State Thruway Authority, endorsed further study of the project. They indicated it might make more sense to create a walkway than to tear down the existing bridge. Despite overall applause for the coming bridge replacement, there has also been criticism that the fast progress has come at the expense of the optimal project. Transit advocates are upset that the new bridge will not include rail lines or bus service. The Tri-State Transportation Campaign, a nonprofit group advocating for alternatives to motor-vehicle use, recently began running radio and newspaper advertisements that criticized the absence of mass transit in the current design. Hearings on the project’s environmental impact statement are scheduled for Feb. 28 in West Nyack and for March 1 in Tarrytown. Mr. Madison and Mr. Cuomo said that the new bridge would provide areas for bikers and walkers, unlike the old one, and that it was being built to support mass transit, which can be added when more money is available. POUGHKEEPSIE, N.Y. — “This is gorgeous!’’ exclaims Mary Bentivegna of East Brunswick, N.J., flinging her arm toward the broad, blue band of the Hudson River, more than 200 feet below. “It’s something you don’t see just anywhere — certainly not in New Jersey. On this dazzling morning, flecks of orange and crimson dot the west riverbank against a cerulean wash of sky, as Bentivegna and a friend from Brooklyn savor their first foray onto the Walkway Over the Hudson, the longest pedestrian bridge in the world. The walkway — 6,768 feet, or 1.28 miles — connects the small industrial city of Poughkeepsie, on the Hudson’s east bank, with the hamlet of Highland, on the west. Its ribbon-cutting last year marked the second incarnation of this structure, which started out as a railroad bridge in 1889, the same year the Eiffel Tower was erected. Then, too, the Poughkeepsie-Highland Railroad Bridge merited a superlative: the longest cantilevered and truss span bridge in the world. During World War II, when it had its heaviest use, 3,500 rail cars, most of them filled with US troops, thundered over it every day. A fire in 1974 ended the first chapter of the bridge’s history. Like Manhattan’s High Line, another former railroad bridge-turned-linear park, this bridge owes its rebirth to preservation-minded citizens. In 1992, they organized to resurrect it for pedestrians and cyclists. (The bridge now forms part of the Hudson Valley Rail Trail.) The nonprofit Walkway Over the Hudson eventually bought the structure and raised private and public money to renovate it, paving the deck with 973 concrete panels weighing up to 15 tons apiece. New York State now manages it as a State Historic Park. The walkway lacks the High Line’s high design — no artful benches or plantings interrupt the broad deck. (The organization’s website says that seating and other amenities will be added as financing allows.) This experience is all about the views beyond the stout steel railings — and the public is loving it. In the first three months after opening, about 400,000 people (an average of 4,500 people a day) came to sample the scenery. Even on this crisp Wednesday morning, a surprising number and variety of people have stepped out: walkers of retirement age zipped into windbreakers, mothers pushing strollers, dogs tugging their humans, bare-legged young runners, and the occasional helmeted cyclist. But the deck is far from crowded, and it’s easy to imagine that hundreds of people could be up here at once without rubbing elbows. At the tree-lined Poughkeepsie entrance, a cluster of high school-age boys in running clothes bursts out of the leafy shade, their rubber soles clapping the pavement. Before the span reaches the water, it crosses through a residential neighborhood and over a four-lane highway (Route 9), and an active railroad track, all visible through the black wire fence that towers 8 to 10 feet over the shoulder-high steel railings. But when the span reaches the river, the fence ends, and nothing obstructs the big view of water below. The parking lots, bathrooms, and the bridge are fully accessible, and several other people are making the crossing in wheelchairs or using canes or walkers. One frail-looking man is moving west to east with a walker, taking one gingerly step at a time. Puffing, he glances up and smiles. A younger man in a ball cap and sunglasses leans against the north railing, staring upriver. Sean Kelly moved to Poughkeepsie from Roslindale, Mass., about five years ago. As a food wholesaler, he often drives along the river, and he keeps an eye out for boats. Today he spotted what he thought was “a big yacht’’ and came up to take in the craft from a better vantage point. The white ship Kelly is watching — the only one in sight in either direction — is plowing a V through the water. As it passes beneath, it looks more like a sightseeing ship than the sleek yacht it resembled at a distance. But such surprises are part of the fascination of watching boats. Jane Roy Brown can be reached at janeroybrown@verizon.net. East Entrance: 61 Parker Ave.
Year round 7 a.m. to sunset, weather permitting (check for closures onfacebook.com/walkwayoverthehudsonor twitter.com/wothshp). Free. Paid parking lot ($5 for 4 hours) with handicapped-accessible bathrooms, at 61 Parker Ave. Walking, jogging, cycling, rollerblading. Dogs on leashes allowed. Hudson Valley Rail Trail Association, Inc.
12 Church St., Highland, N.Y.
POUGHKEEPSIE —More stimulus money has reached the Hudson Valley in the form of a $2.4 million package that will provide an elevator and stairs on the east end of the Walkway Over the Hudson. The elevator and stairs will rise 212 feet to reach the surface of the old railroad bridge that closed after a fire in 1974 and reopened as a state park for pedestrians last October. Some 50 people came to a recent meeting, presented by the state Office of Parks, Recreation and Historic Preservation, which manages the walkway. Planners had considered the elevator when the bridge was converted into a pedestrian way, but they lacked funding. In its first 10 months, the 1.28-mile walkway has drawn more than 660,000 visitors, according to Sally Mazzarella, chairwoman of the walkway board. She said the walkway, which cost $38.8 million to create, has provided many economic benefits to the region. Project Manager C. Michael Cooper of Bergmann Associates in Albany said construction of the elevator and stairs will begin next spring and be completed by the spring of 2012. The American Recovery and Reinvestment Act, under which stimulus money is distributed, requires a quick turnaround. Cooper said the glass and aluminum elevator will provide fine views of the river. It will accommodate 25 passengers and make the round trip in five minutes. The tower supporting the elevator will be designed to accommodate two additional elevators. Cooper said the project will provide further economic benefits, connecting waterfront trails, the Poughkeepsie train station, the Mid-Hudson Children’s Museum, restaurants and other businesses.